Most educators who learn to use Twitter effectively say they learn more from their personal learning network (PLN) on Twitter than they’ve achieved from any other forms of professional development or personal learning. Unfortunately educators often dismiss Twitter, or fail to see the value of Twitter, when they’re first introduced to Twitter. 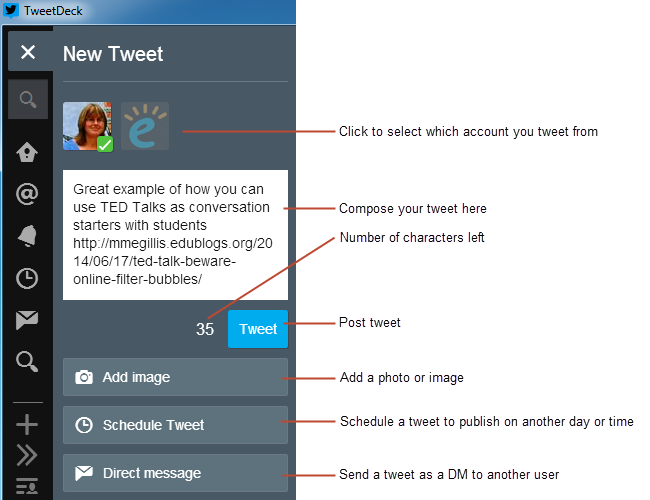 Our aim of this post is to provide all the information you need to learn how to use Twitter effectively as an educator. We regularly update this post with new information. This post was last updated June, 2014. What to do if your twitter account is hacked. The original Twitter-a-holic’s Guide was published in July, 2010 when I’d just returned from attending a large conference overseas and realized that while a conference can make you feel really overwhelmed and alone — especially amongst the 13,000 ed tech professionals participants who attend it each year — I never felt alone. Because for Twitterers conferences are like walking into a big party where you know everyone and are meeting up with old friends. So I decided to share advice on using twitter to help others since I’ve been using Twitter since March 2007 and wrote the post with assistance from my twitter network and readers comments — thanks everyone who helped! For those who have heard of twitter and have dismissed it thinking ‘”Twitter is for people with too much time on their hands” — think again! Educators are connecting with each other on Twitter and using it like a lunch room that’s open 24/7 whenever they need help, assistance or just want to connect with others. The post you are currently reading is an updated version of the original post which I published in 2012. We’ve now redirect all traffic from the original post to this post; and regularly update this post. This post was last updated June, 2014. Twitter is an online social network and micro-blogging service that enables users to send and read tweets on their computer and mobile devices, in the form of text messages limited to 140 characters. Common misconceptions are that twitter is: for celebrities, sports stars and journalists: like posting an update to Facebook; or like an email where you need to read everything. Twitter is about connecting with others as part of a global community who will help you with your learning, improving your lessons, helping your students connect with other students and content experts. Watch this video to learn how Twitter is used effectively in education. Go to Twitter and create your account. Choose a username that makes it easier for others to relate to you as a real person and conveys the right impression of who you are. e.g. 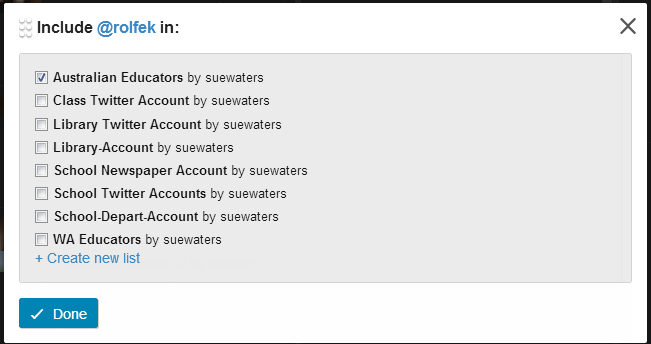 Compare spwat3 with suewaters — which is easier? But don’t stress too much — your username can be changed anytime without affecting your twitter account by editing your profile information. When you initially sign up for Twitter it takes you through a series of steps where you can select people to follow. DON’T follow anyone when you first create your account. You need to scroll to the bottom of the page and click “Skip this Step” until you get to your main Twitter page as it is important to set up your profile information and post a few tweets before you follow anyone. Watch this video on how to sign up for your account. Complete your bio and add your blog/website URL (if applicable) — people use this information to decide whether they follow you. Focus on providing information that helps others work out if you have similar interests/background. Upload your twitter profile picture — people are less likely follow those using the default avatar as it’s common for a spammer to use a default avatar. Don’t start following people on twitter until you’ve published some tweets! Most people won’t follow a person who hasn’t updated. Watch this video on how to upload your profile image, twitter header and edit your twitter profile. Watch this video to learn how to post your first tweet. Choose about 100 people to follow initially. You can always add more as you go and this helps you not feel overwhelmed when starting out. Find people to follow who have similar interests or with blogs you like who either share great info and links or who willingly engage in conversations. Follow a few people you know and follow who they follow. Look at who they chat with or check their Following list. Find a twitter mentor who will help and guide you. Get them to ask their followers to add you. You can always ask me to help by sending an @suewaters tweet. Make sure when people do start adding you that add them back quickly and thank them for adding you to their account!!! Don’t just follow anyone — follow those who have the same interests and who you like. Remember following does not have to be forever — you can regularly update/change who you follow to suit your needs. Think about how you want to use it — to follow latest news? to follow other educators? to share what you know? to connect with others? Check out the Edublog Awards Best Individual Tweeter 2013 list to find educators others recommend following! Participate or check out the different weekly hashtag conversations. They are a great way to find new people to follow (refer to hashtag information below). Check out new followers before following. Look at their bio, how many they are following, how many follow them and their latest tweets. This information helps you work out if they are the type of people you like to follow. Watch this video to learn how to follow people. Twitter is very similar to a face to face conversation. Think of Twitter as a conversation with work colleagues in the lunch room. A mixture of small talk, relationship building, helping others, getting help and sharing is just as important on Twitter as it is in the lunch room. Be patient. It takes time to build your Twitter network. Use it everyday for four weeks, even if only for 5 minutes per day. Some people find that setting a goal of 15 minutes a day for the first few months helps. Remember twitter is a two way conversation — you need to answer as much as you ask but most importantly share, share, share. Participate and say something, anything. Don’t always expect people to always answer. It does depend on how many you follow and what you’re asking. Use a twitter client where possible and not the web interface. Remember online is forever. If you didn’t want it online don’t say it in the first place. It’s extremely easy for others to misinterpret your written text. Remember this! Think about how what you say reflects on how people visualise you. Educators love following people who share great links since it saves them time. Steven W Anderson’s (@web2classroom) is a great example of this type of Twitterer. Watch this video to learn how to reply, retweet and engage in Twitter conversations. an @reply is used when a person is having a conversation with another twitterer. An @reply starts with the @username of the person who the tweet is directed at. You’ll only see @replies between two people if you follow both twitterers or you are looking at another person’s tweet timeline. Mentions is any Twitter update that contains “@username” anywhere in the body of a tweet. For example, you use @username within a tweet when referring to specific twitter users. All your twitter followers are alerted to tweets including @username provided the @username isn’t placed at the start of the tweet and the person who you mention isn’t using a protected Twitter account. Your @replies and mentions are located under Mentions on the Notification page. Direct messages are private messages sent from one Twitterer to another. They can’t be seen by other users. You can only send a direct message to a person who follows you and they can only reply to your direct message if you also follow them. It’s bad twitter etiquette to send a direct message to someone that follows you that you don’t follow back — they can feel uncomfortable asking you to follow them when you initiated the direct message. Direct messages are accessed by clicking on the envelope icon in the top right navigation bar via the web or on the Twitter app on your mobile device. Any word starting with the “#” hash (pound) symbol is known as a hash tag. Hash tags make it easier to search and follow the twitter conversations on specific topics. Read more about connecting with others using hashtags here. Any tweet starting with “RT” means someone is re-tweeting some one else’s tweet. Retweets are used to quickly share tweets by someone else that might contain links, news or anything you think your twitter followers will find interesting. Retweeting is an important way twitterers share information across the Internet. You won’t always see “RT” at the start of a retweet as it does depend on what twitter client you are using. Some clients enclose the Tweet in quotes while other clients may add via and the original twitterer’s username at the end of the tweet. If you are a blogger than it’s important to add a Retweet option to your blog posts, such as AddThis Social Share or Share Options, as Twitter is an essential way people now learn about posts worth reading. Any tweet starting with “MT” means someone is re-tweeting some one else’s tweet but have modified the tweet. A re-tweet might be modified to make the tweet fit into the 140 characters or to add your extra thoughts to the conversation. Used to quickly share tweets by someone else that might contain links, news or anything you think your twitter followers will find interesting while making your followers aware that you have modified the tweet. Retweets and modified retweets are an important way twitterers share information across the Internet. Favorites are represented by a small star icon next to the tweet and are normally used when a twitterer wants to save (refer) to a tweet later. When you favorite a tweet the original person who posted the tweet is notified that you like their tweet. You access the tweets you have favorited by clicking on Me in the top right navigation bar via the web or on your Twitter app on your mobile device and clicking on Favorites. Learning how to search twitter well is a key skill for getting the most out of Twitter. You can search for any person, keyword, hashtag etc using the search box in the admin bar via the we or use the # Discover section. The # Discover section is all about discovering new content. Here you’ll find curated tweets from people who you don’t follow and can search for content. When geolocation is activated (Settings > Account) you’ll also see curated tweets from what going on near you in real time. Try it out for yourself! Next time there’s an important news story locally or globally go to the # Discover section add the name of the location or event and check out the latest tweets as it is being reported. The Notifications tab offers a simple way to see how others on Twitter are interacting with you. Just click on Notifications in the top left navigation bar via the web or on the Twitter app on your mobile device. and you see all tweets directed to you (@replies and mentions), new followers. your Tweets that have been favorited by other users and any twitter lists you’ve been added to. Click on the Mentions tab on the Notifications page if you only want to see your @replies and mentions. By default, when you sign up for Twitter your account is public and any one can see your tweets. Some twitter users prefer to use Protected twitter accounts where their updates are kept private — where only approved followers can see their tweet updates. You change your privacy options in Settings > Security and Privacy. If you choose to use a Protected Twitter account then you need to understand there are people who won’t follow some one who uses a protected twitter account. For those who won’t follow protected twitter accounts it is important to understand there are numerous reasons why an educator use protected account and it might not be related to concerns of posting an inappropriate tweet. It is also important to be aware that if you tweet to several people in the same tweet, and one person has a protected account, the other people won’t see your tweet if they aren’t being followed by the protected Twitter user’s account. A twitter client is a MUST as they provide instant notification of the latest updates and easy response to the tweets. Which Twitter client you use is personal. TweetDeck and Hootsuite are popular because of their ability to add extra columns makes it easy to filter and keep up with conversations using the columns. 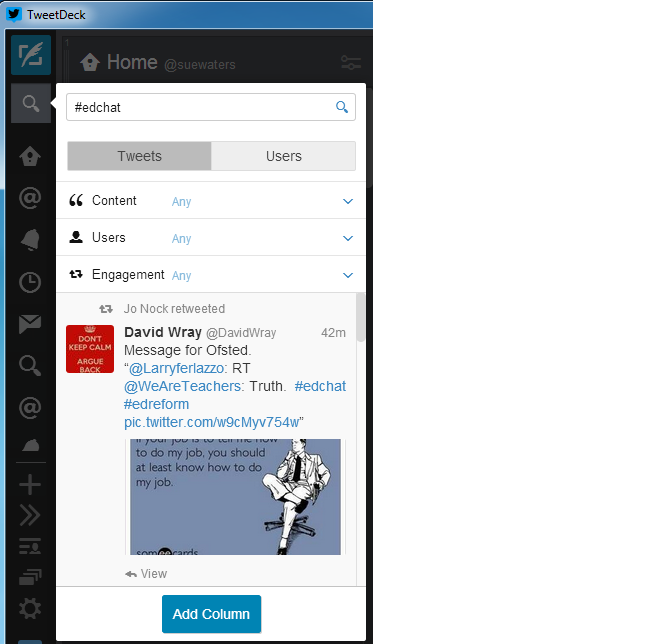 You can sign into TweetDeck and Hootsuite using your web browser. 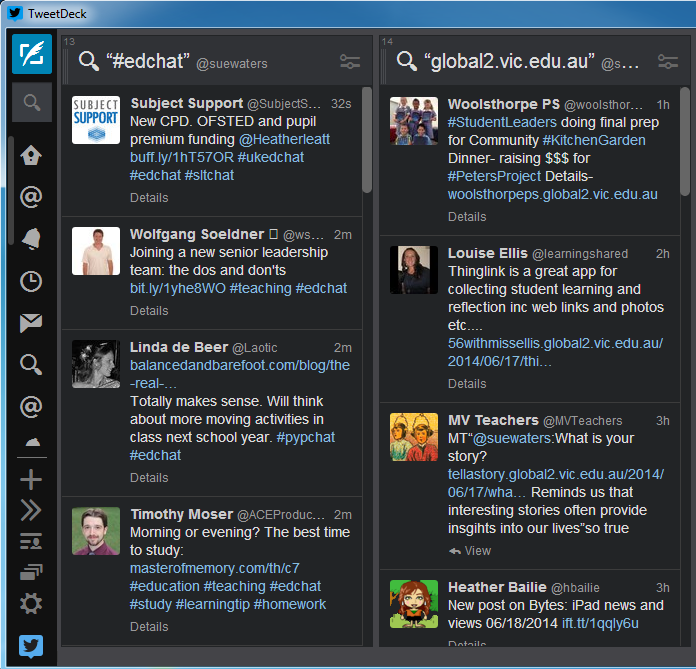 I personally prefer using the desktop version of TweetDeck. TweetDeck is one of the most popular desktopTwitter client because it’s ability to add extra columns makes it easy to filter and keep up with conversations using the columns. The other benefits of TweetDeck is it allows you to manage multiple Twitter and Facebook accounts, using your TweetDeck account, and synchronize your configuration when you use TweetDeck on different computers and mobile devices. 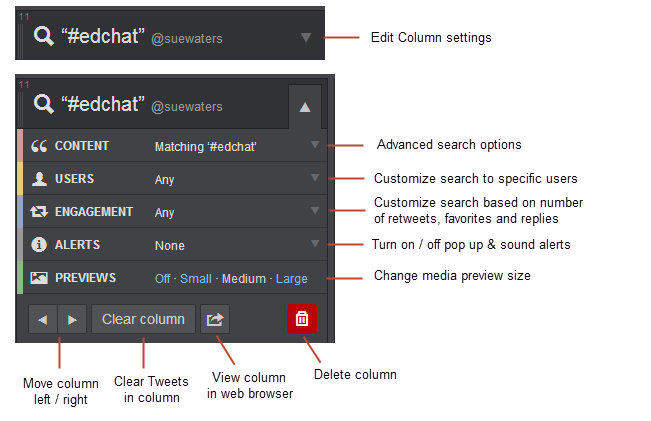 No need to reset up your columns of @, searches, inbox, hashtags, lists and so on again! 1. Go to http://tweetdeck.twitter.com/ or install the desktop version of TweetDeck. 2. Launch TweetDeck and sign in with your Twitter account. Use a twitter account that isn’t shared with other people. Once you have signed in, you can connect multiple Twitter accounts to your TweetDeck account. 3. 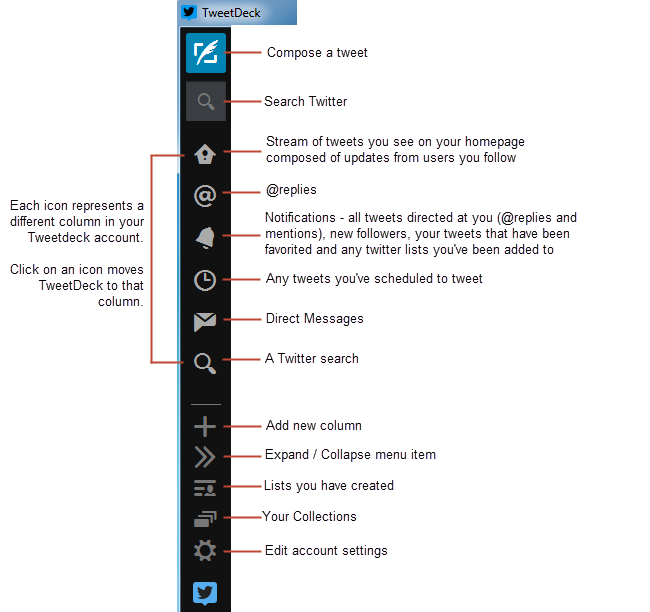 Below is a summary of the main features of TweetDeck. 4. Just click Compose a tweet icon to write your tweet. 5 Here’s a quick overview of what each icon on a tweet does. Clicking on the More icon reveals other options. 6. You can move a column, customize, change alerts and delete columns by click on the down down arrow on a column. Watch this video to learn how to use TweetDeck. There are a wide range of Twitter apps you can use on your mobile devices however the most commonly used is Twitter’s own Twitter app ( iOS | Android ). Refer to the following video tutorials to learn how to use the Twitter app. I was unable to find any good video tutorials for Androids and I recommend you watch the video tutorials for iOS devices as the Android Twitter app version is very similar to the iOS version. Watch this video to learn how to use the Twitter app on your iPhone. Watch this video to learn how to use the Twitter app on your iPad. It’s common to see links posted on Twitter appear as shortened links because it makes it easier to include a URL within the 140 character Twitter limit. Previously if you wanted shortened a link when writing a tweet on the Twitter.com web interface you had to use a URL shortening services, such as tinyurl.com and bit.ly, and then paste the shortened link into the tweet box on Twitter.com. Twitter has now introduced automatic link shortening which means you no longer need to use a third party service to shorten your links. All links posted into the compose box on Twitter.com, TweetDeck and their mobile Twitter apps are automatically shortened. Please note some twitter clients automatically shorten links for you using services such as bit.ly. Unlike other URL shorteners, Twitter’s shortener, t.co, creates a link that is a shortened version of the original link and includes the full domain name so your followers will know the site they are going to when they click the link. Shortened links are a common method used to hacked Twitter accounts . URLs converted by Twitter’s link service are checked against potentially dangerous sites — this is designed to help protect users from malicious, phishing and offensive links. A hashtag is any word on twitter that starts with the “#” hash (pound) sign. How it works is everyone agrees to use a standard hash tag in their tweets when they tweet about a specific topic. Then you set up a search for that hashtag using your twitter client, or use twitter search tools such as Twitter Search, Twitterfall or Tagboard to track the conversation. #ELTchat-used for discussions between EFT educators on thought provoking topics. #edcamp– Edcamp are educator unconferences and #edcamp (or variations of #edcamp with the conference) is the hashtag used for them Here’s where you can learn more about Edcamp. 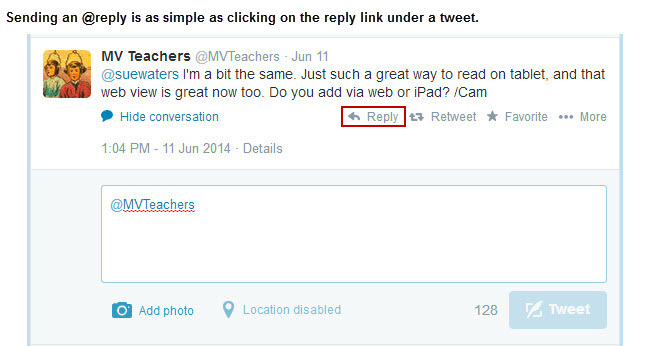 #ukedchat – ukedchat is a more UK-educator friendly version of the very popular twitter discussion #edchat. #cpchat -where Principals can go to connect on Twitter and have an ongoing conversation with other Principals (learn more here). #edchatie – Irish freiendly version of #edchat (learn more here). #edtech – general hash tag used for posting about technology related resources for the classroom and education. #educationation – created by NBC last summer ti highlight their series on reports on Education in the USA. #educoach – for instructional coaches/leaders. #eduit – Blends the educational side of technology with the technical side. #elemchat -To provide elementary (or primary) school educators a venue for discussing issues and strategies that are specific to teaching in the elementary school context (learn more here). #ellchat – repository of ideas for teaching English language learners (learn more here). #engchat – English freiendly version of #edchat (learn more here). #lmchat – For those interested in the topic of learning from one another and who want to discuss how to help other people learn in formal, informal, social and mobile ways (learn more here). #mlearning – for conversations on mobile learning. #musedchat – for music education (see more here). #pegeeks – for health and physical education. #pencilchat – amusing and thought provoking parody about ICT use in schools. #scichat – for science educators (see more here). #slpeeps – for speech language pathologists and students (learn more about #slpeeps here). #spedchat – for special education (see more here). #tlchat – for school librarian community (see more here). #ukfechat – for UK educators interested in further education discussions (see more here). #yourmatter – Created by @AngelaMaiers to talk about how we are all wonderful in our own ways. TeachThought’s The complete Guide to Twitter Hashtags for Education. Learning how to use hashtags well, and who you follow, are key skills for getting the most out of Twitter. Twitter chats are where educators meet at a set ‘meeting time’ to engage in conversations by sending out tweets on a topic using a designated hashtag during a specific time on a certain day. During the twitter chat you’ll see educators tweet their responses in real time. The best way to participate in a Twitter chat is to set up twitter search for the hashtag in TweetDeck, Hootsuite or in the Twitter app on your mobile device. You’ll find our detailed step by step guide to participating in Twitter chats here. #edchat – normally takes place on Tuesdays around 12 PM EST (USA) and 7 PM EST (USA). Learn more here. #edchatie – Irish friendly version of #edchat (learn more here). Takes place every Monday night 8.30-9.30 PM (GMT). #engchat – English freiendly version of #edchat (learn more here). Takes place every Monday at 7-8 PM EST (GMT). #kinderchat – for those working with small children (learn more here). Takes place on Mondays 9.00 PM EST (USA) and 8:30 PM EST (USA). #spedchat – for special education (see more here). Takes place on Tuesdays from 9:00-10:00 PM EST (USA). #ukfechat – for UK educators interested in further education discussions (see more here). Takes place on Thursdays 9:00-10:00 PM (GMT). You’ll find a complete list of weekly Twitter Chats here. Watch this video on How to participate in a Twitter Chat. This is a ‘must watch’ video for any one who wants to host a Twitter chat because Vicki Davis shows examples of schedule tweets she has set up in HootSuite to help participants (you’ll see these examples at 2:25 minutes into the video). HootSuite works very similar to TweetDeck. Learn how to schedule Tweets for a Twitter chat here. A great aspect of twitter is you can organize other twitter users into groups called ‘lists’. When you view a list, you’ll see a twitter stream of all the users that are included in that group. Lists let you organize your followers into different groups of people and/or areas of interest. Instead trying listen to what all your twitter followers are saying; you can focus on the key conversations by the main people whose tweets you want to read. This reduces the noise created when you’re following lots of users; saving you time, makes your life easier and lets you quickly connect with those you most want to interact with. Twitter clients and the Twitter.com web interface are designed to let you quickly check your twitter lists. Twitter lists can be public or private. A public twitter list can be viewed by anyone and other twitter users can quickly follow your list or choose people from your list to follow. A private list and who is on that list can only be viewed by you. Public list also highlights who other twitter users recommend as worth following. If you look at a user’s profile in TweetDeck it displays the number of lists a user has been added to. Twitter lists are handy if you’re running a workshop on using Twitter, or want to encourage your students to follow specific twitter users. It’s as simple as creating the list and then getting them to either follow the list or the users on the list. You don’t need to be following some one to add them to a list. Subscribing to someone’s list doesn’t mean you now following all users on that list. You’ll just see the tweets from users when you view that list. You need to click follow next a user if you want to follow them to have their tweets appear in your twitter timeline. 1. Click on the Lists icon in Tweetdeck. 2. Click on Create a list. 3. Add the name of your list, a short description (optional) and choose if it is public or private (only you can see a private list). 5. Add / remove users to / from your list by selecting ‘Add or remove from list’ under the More Link under a tweet. Or using the ‘Add or remove from list’ option on a user’s profile page. adding them as you see their tweet. 6. Now just select which list to add them to and click Done. 1. Click on the person’s List tab located under More on their profile page. 2. Click on the list you would like to subscribe to. 3. On the list page click Subscribe to follow the list. 4. Alternatively you follow people on the list by clicking on List members and then Follow for those you want to add to your twitter account. Watch this video to learn how to create a Twitter list. 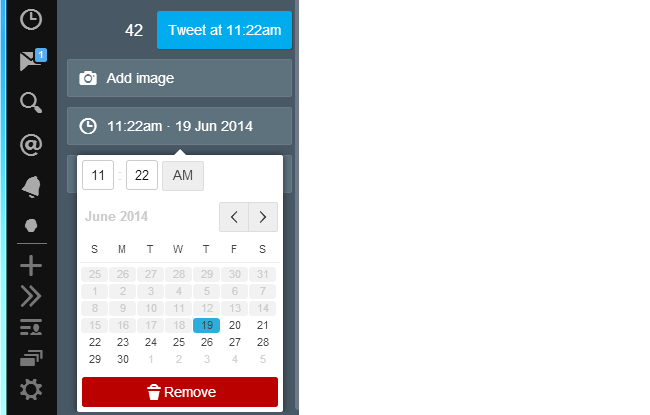 There are a range of tools that can be used to schedule your tweets to be posted at specific times and date. Promoting events or sharing details on conference sessions – especially when you might be busy at the event. 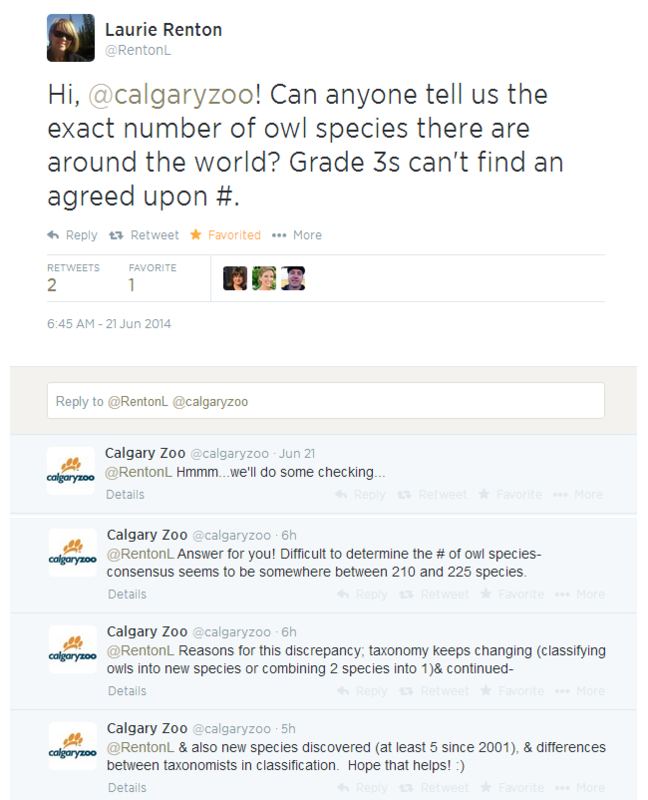 Sharing information with twitter followers in different time zones. Sharing links and information while you’re away. Situations where you might forget or can’t post but want to make sure the information shared. 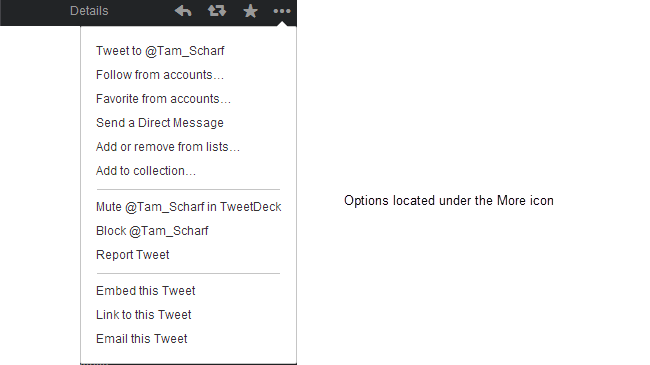 A simple option is to use TweetDeck. 2. Compose your tweet and then click on Schedule Tweet. 3. Select the date and time you want the message to be tweeted. 5. A new column will appear with your scheduled Tweets. 6. You use this column to edit or delete a schedule tweet at any time. 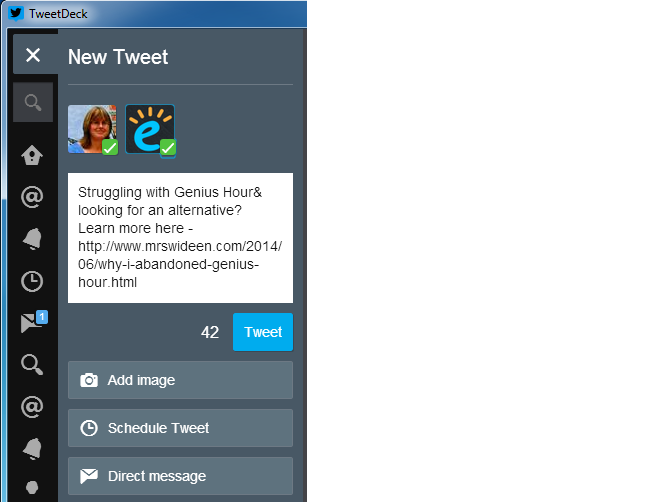 Watch this video to see how you schedule a Tweeting using Tweetdeck for a Twitter Chat. A cool aspect of Tweets is you can easily embed them into your blog posts. Twitter launched a new profile design in April, 2014 and one of the key changes was a larger profile image and header image that spans the width of your screen. Prior to this change you would personalize your profile design using a background image. With this new Twitter profile design, background image is no longer needed, because it isn’t visible on your profile page and the header image is now how you make your account stand out from others. The background image still shows up when someone views an individual tweet or a list you’ve created however most recommend you change to a solid background color if you had been using a background image previously. You can remove your background image in Settings > Design. 1. Click on the Me tab in the top left of the navigation bar via the web. 3. Click the camera icon over your header image to change your header photo. Select to Upload photo or Remove, or simply drag and drop a photo into this section. Recommended dimensions for header photos are 1500 x 500 pixels. The header is visible when someone visits your profile from any device; and changes with screen size. The header has visible and invisible areas that change depending on if your profile is viewed on a computer, a tablet or a smartphone. Refer to this header template to learn more. Recommended dimensions for profile photo are 400 x 400 pixels. There are Twitter worms that work by hacking users account by stealing their account credentials when the user clicks on the link. Unexpected tweets or sudden unintended DMs being sent from your account are indicators your account might have been compromised. Here’s what you need to do if your account has been compromised. A twitter network is a rich source of great links to read and it’s handy to grab these links using twitter tools so you can check them out at your leisure. Flipboard – collects the content of social networks and websites and then presents them in a magazine format on a mobile device. Learn more about using Flipboard here. Shiftlinks – creates an RSS feed of your links posted by your twitter followers which you can subscribe to using an feed reader such as Google Reader. This works works well when following a small number of people. Paper.li – creates a daily newspaper based on the top links shared by your twitter follower. Here’s my personalised Paper.li. Paper-li can be set up to send an automatic tweet of your daily newspaper and identify the source of your top stories of the day based on RTs, Favorites etc. Flipboards is very popular for any one using an mobile device because it allows you to easily read, share, bookmark and retweet links from within the Flipboard app. Learn more about using Flipboard here. Watch my video on how I use Flipboard to keep up with links shared on Twitter. There are so many tools for getting even more out of using twitter. Check out the Definitive list of Twitter tools to see some of the different options. Educators aren’t just using Twitter for their personal learning; they are also using it in innovative ways in their classrooms. We’ve seen a significant increase in the number of class and school twitter accounts. You’ll find a comprehensive list of Twitter class accounts here. 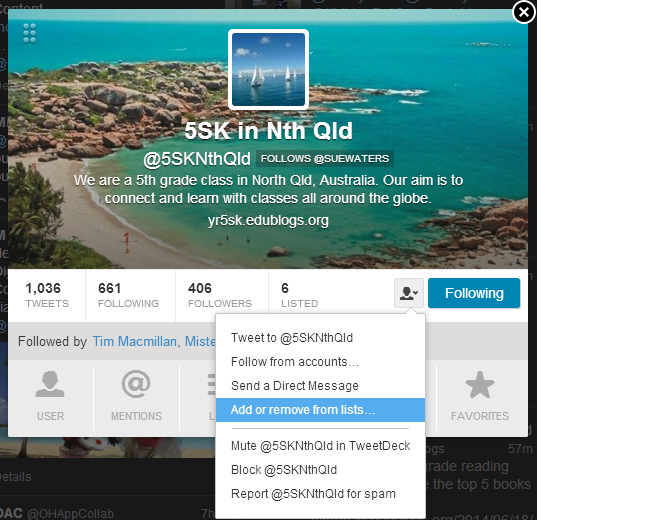 Set up a classroom twitter account separate from your personal twitter account. Most teachers allow their students to log into the class twitter account during class to compose tweets but the tweets aren’t allowed to be sent until checked by the teacher or an adult. If you decide to use a hashtag make sure it isn’t being used by others. Carefully select who you follow as students will see all tweets by any account you are following. Drew Frank’s Classroom Twitter list is a good place to find other class twitter accounts to follow. Make sure parents are aware you are using Twitter in class and check your school’s policies to find out if parent’s need to sign a permission form. Karen Lirenman’s permission form is located here. 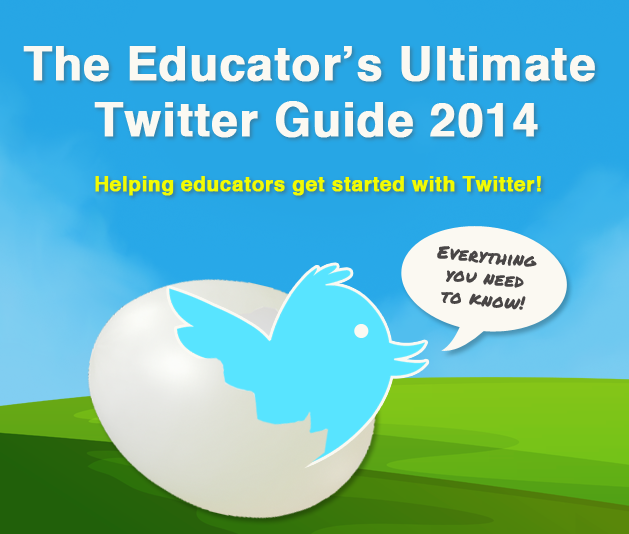 The Ultimate Guide to Using Twitter in Education. Using Blogs and Twitter with Young Students: This is what it looks like. Using Twitter to learn maths. Learning with Twitter – What’s outside your window? Using Twitter to practice math number stories. Using Twitter to teach voice. Below is a summary of a twitter conversation by teacher using twitter to connect with content experts to help answer student questions. Watch this video of Karen Lirenman explains how she uses Twitter with her Grade One students. Watch this video to learn how Ms Cassidy’s Grade One students use Twitter in their classroom. Here is an example of a teacher using Twitter with English language learners. Have we missed any important tips or resources? Thanks for the info. It’s really helpful. Thank you for all that. Can you tell me what a camera icon in a box means when i try to reply to a rweet. Does it mean all responses are blocked? Hello, I’m facing problem Right now is about replies and mention, if I tag or mention any one of my friens ,thy did not receive my tweet, even thy not receive notification , but all tweets I done is appearing in my profile timeline , can you help me ? Hi, thanks for the superb guide! I am new to Twitter. I’m trying to see all tweets that contain a certain blog link – is there a way? I just started tweeting and have set up a list. How do I just send out a tweet for the entire list? What is twitter’s policy when it comes to people using someone’s name and picture? I’ve noticed that there are a lot of people in twitter using someone’s name and picture? Glad to hear it. I hope it works well as a teaching/learning tool for you and them. Thanks you so much for this, Sue! This might sound like a silly question but would you mind telling me what the white check mark (tick) inside a blue shape stands for? I see this symbol next to some twitter people’s name but I don’t know what it means. When I send a message on Twitter, our organization’s profile photo is sent with the message, not the photo I uploaded with the message. This just started happening last week. I need the photo that is attached to be sent. I hope you can help. Thanks. hi again, i do have another question that i think was a little confusing the last time i asked. is there anyway of knowing if the person that i tweeted received my tweet or not. like say if i twitted you, but you didn’t tweet me back, how would i know that you even received my tweet in the first place. i have been tweeting even my friends and twitter support, and i have no idea if they have received my tweets or not. hi, i was wondering a few things. i have seen someone’s twitter page & it did have tweets on it originally, but now it doesn’t, does that mean rather he has deleted them or has he blocked me. second question. i tweet people pretty often, and they don’t usually retweet or tweet me back and that is perfectly find. the thing i’m confused about is, how do i know that they have received my tweets at all. and if they don’t receive them then what does that mean. thank you. It really depends on the person. If you look at their timeline it indicates how active they are on twitter and how likely they are to reply to people. If someone hasn’t tweeted for months than it is unlikely they are checking your tweet and would reply. Similarly, if someone generally doesn’t like to reply to people it is unlikely they will reply back; or if they only reply to a few people they are less likely to reply. It also depends on what you are asking someone. Retweeting is all about how many people are following you and how valuable they find the information you share. I have a large following so I am more likely to have my tweets retweeted than someone that has 200 followers or less. Thanks for the very useful guide. We are building a twitter tool and I have some questions on the best way to send requests over twitter. Would you mind if I contact you to ask some questions? Thanks for sharing these pithy, focused tips. Thank you so much for this post. I am going to teach a PD class about Twitter at my district and I plan to share this post with the teachers. I had been wondering how I could get them started with some suggestions of people to follow, when I read the section of your post about creating and subscribing to lists. I had completely forgotten about that feature! Thanks again. Thank you for your response Sue. I just sent a support request to Twitter so hopefully they will respond. Hi Chris, I can totally understand your frustrations. We’ve had several emails into Edublogs support reporting the same issue. For some reason Search Twitter isn’t indexing hashtags properly for some users (or maybe for some hashtags). We did send tweets at Twitter support and received no response. I’m sure they are probably aware of the issue. You could try submitting a support request by their contact form to get them to explain why there is an issue.